As a chamber member with 2-50 employees, you can get a discount on any health plan from Anthem Blue Cross andBlue Shield — including industry-leading HSAs, HRAs and HIAs. *Despite the ongoing changes and confusion surrounding healthcare reform, your local chamber continues to offer employer insurance options for the 23rd straight year with a 1.4%discount exclusively for chamber members! Please go to the Chamber website http://www.cocchealth.com/ for more information or call 1-888-506-1574. Did you know that many alternative discounts are available to help reduce your annual Ohio workers’ compensation costs? Through the Greater Powell Area Chamber program, your organization can be evaluated for qualification in a variety of alternative rating programs to reduce your costs. 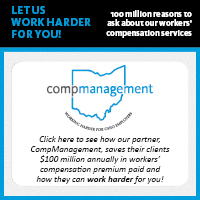 Our program, administered by CompManagement, Inc., offers you quality service and stability through the complex workers’ compensation environment. Please contact Rejeanna Woolum-Napier at 614-359-2403 for a no cost evaluation to see if you qualify or click here to request a savings quote (AC-3) form. CompManagement, Inc. (CMI) Risk Services brings a fresh approach to developing and maintaining a risk, health and safety management program. Whether working with an organization where there is no on-site expertise or consulting with a client’s existing personnel, our all-encompassing expert staff offers unbiased, results-oriented recommendations. Many businesses employ CMI Risk Services instead of increasing the duties of current management personnel or hiring a full-time Health & Safety Manager to develop an organization specific safety program that is easily administered as well as highly effective. CMI Risk Services can perform this function at less cost and with greater effectiveness. CMI Risk Services also offers a full array of training opportunities that not only improve your safety culture, but helps in meeting Ohio Bureau of Workers’ Compensation program compliance requirements. The majority of these are offered through our webinar based “Safety Academy” training series with a variety of topics and meeting dates to best fit your schedule, while eliminating travel time and expense. For more information regarding CMI Risk Services, contact Bryan Carpenter at 614-376-5495. Central Ohio Chamber of Commerce members now have access to discounts on DENTAL, VISION, DISABILITY & LIFE PRODUCTS THROUGH ANTHEM! Contact your broker or Anthem account representative fo more information. You do not have to be in an Anthem health plan to qualify. We stock more than 12,000 essentials - including 900 private brand items, thousands of technology solutions, even ready-to-assemble furniture. So you can order everything you need in one place, and get back to work sooner. SIGN UP AND START SAVING today with the Greater Powell Area Chamber OfficeMax Savings Program and take advantage of discounted prices. Contact Alicia Alare at aliciaalare@officemax.com or 614-440-7092 or download a registration form. The Greater Powell Area Chamber of Commerce has teamed with Constant Contact ® , the leading email marketing service to bring an exciting way for Chamber members to stay in touch with their customers. Chamber members will receive an exclusive discount when they sign up for the service through the Chamber. There is also a 60 day “Free Trial” available to members. Chamber members who are already Constant Contact customers are also eligible for the discount program. They simply need to send their account user name and a request to receive the Greater Powell Area Chamber discount to: businesspartner@constantcontact.com. Your account will be immediately updated. Build and manage your email addresses. Save up to 50% on brand and generic prescription medications! Available to you and your employees for FREE!